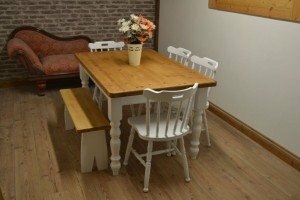 A farmhouse style solid wood dining table, together with four matching curved back dining stools and matching bench. 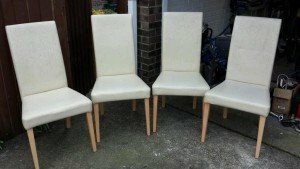 A set of four high back dining chairs on solid wooden legs, upholstered in white faux leather. 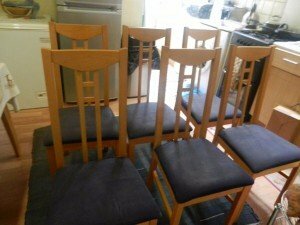 A set of six solid pine high back dining chairs, upholstered to the seats in dark grey velour. 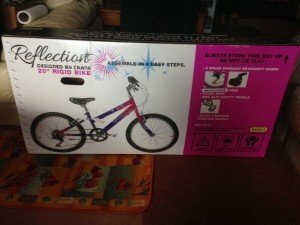 A brand new in box Reflection 20′ rigid purple and pink children’s bike. 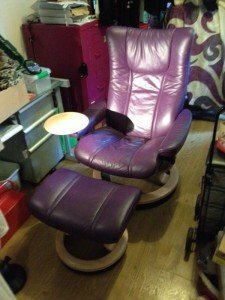 A high back swivel armchair and matching footstool, upholstered in purple faux leather. 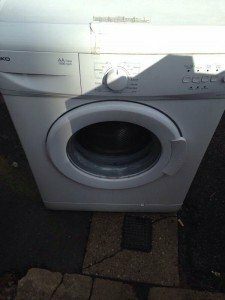 A white 5kg Beko under counter 500 spin washing machine. 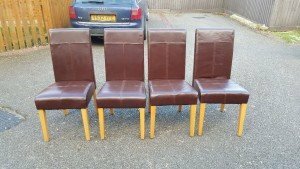 A set of four high back dining chairs on pine legs, upholstered in chocolate brown faux leather. 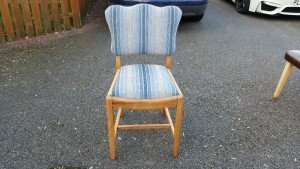 A vintage elm wood hall chair, upholstered to the seat and backrest in striped denim. 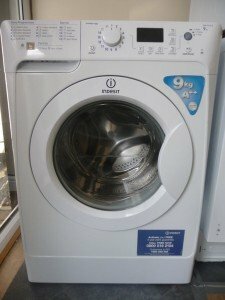 A white Indesit PWE91672 9kg under counter 800 spin washing machine. 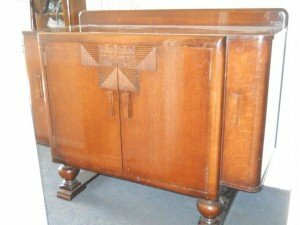 An art deco dark oak G plan sideboard/ liquor cabinet, having double doors opening to reveal two shelves. 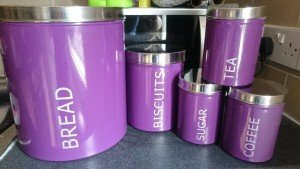 A collection of purple and stainless steel kitchen canisters, to include a bread bin, a biscuit barrel and tea, coffee and sugar canisters. 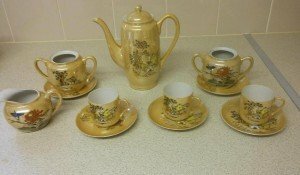 A vintage yellow glazed tea set, includes a large teapot, a milk jug, three teacups, five saucers and two sugar pots. 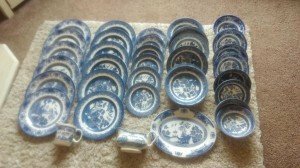 A large collection of willow patterned dinner ware, to include a gravy bowl, a milk jug, a platter dish, dinner plates, side plates etc. 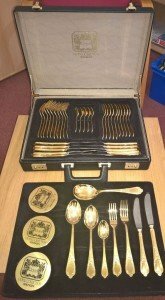 A solingen 50 piece 24 carat gold plated cutlery set in leather case, includes knives, forks, spoons etc. 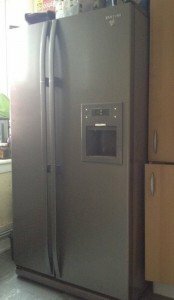 A tall standing silver Samsung double door American fridge freezer with built in water dispenser. 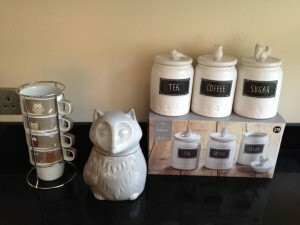 A small collection of kitchen accessories, to include a set of four owl printed stacking cups, an owl cookie jar and tea, coffee and sugar canisters. 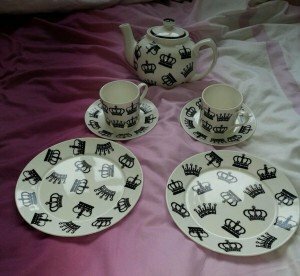 A black and white crown printed novelty tea set, includes a teapot, two teacups, two saucers and two side plates. 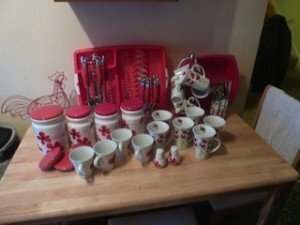 A large collection of red and white kitchen accessories, to include a dish drainer, cutlery, utensils, an egg basket, cups and cup holder, salt and pepper shakers etc. 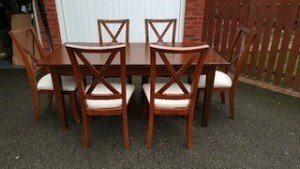 A vintage solid wood dining table, together with six matching high back dining chairs, upholstered to the seats in white fabric. 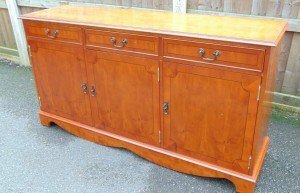 A solid wood vintage sideboard, having three slim drawers above a double and single cupboard.